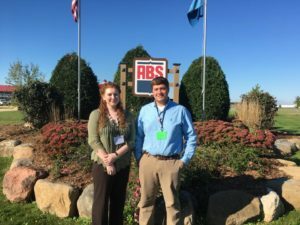 Sarah Smart and Zachary Ross, both from Haywood County, attended the 4H Dairy Youth Conference in 2016. Pictured at ABS Global Headquarters. The National 4-H Dairy Conference is an outstanding opportunity to network with other young people who are also passionate about the dairy industry. This conference meets each year just before World Dairy Expo in Madison, WI. Participants get to attend great educational training’s, visit industry leading dairy farms and dairy businesses, and experience World Dairy Expo…and see some of the best cows in the world! At this conference, youth also get involved in the planning and execution of all the activities, building their leadership skills from the start. With topics focused on dairy production, dairy foods, career development, and leadership- everyone will leave with a new set of skills and a new set of lifelong friendships. Because of the generous support of the NC Dairy Youth Foundation, 2 to 3 youth from NC are selected each year to attend this conference. Applicants are selected based on their activity in local, regional, and state dairy events as well as participation in other organizations and academic performance. Part of the application process includes an in-person interview with the selection committee. To learn more about the application process, you can download a copy of the application 4-H_Conference_Application.